The West Pier designed by Eugenius Birch in 1866. 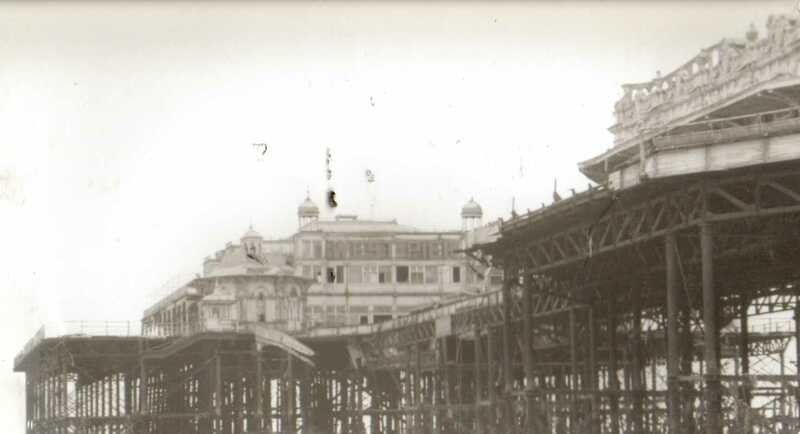 The second pier to be erected in Brighton, the first being the Chain Pier. 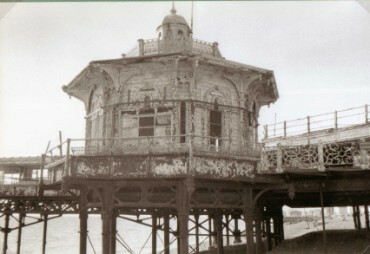 The concert hall wasn't added to the pier until 1916. Closed to the public in 1975 due to its structure being classed as unsafe. 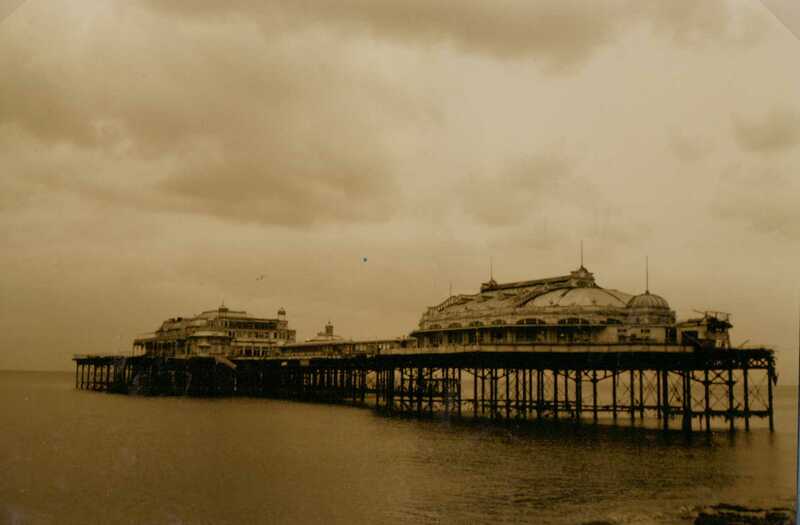 The pier has slowly deteriorated since. 2003 saw the collapse of the concert hall and a couple of months later it was set on fire which left just it's metal frame. I have a vague memory of being on the pier as a child. I recall paying to go on and going through the turnstiles. Now in 2012 it's just a sad metal frame in the middle of the sea, still used by the starlings. Some people say it is an eyesore and that it should be removed. I guess it is but it's also a reminder of what was once there. It still looks amazing to me especially at sunset. 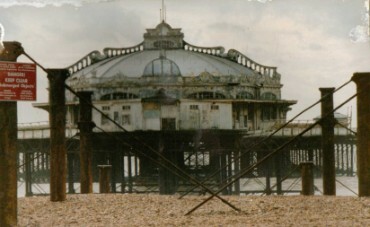 The West Pier, complete in January 1988. Just before the decision was made to remove the central section. 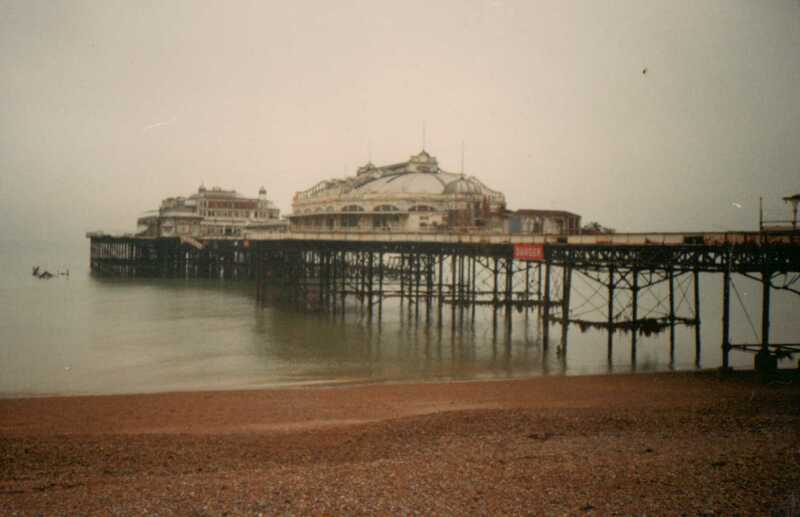 The West Pier in July 1988 The middle section removed as some of the columns were weak. Removal of the middle section would help to save the concert hall. Just visible is the boating pool , long gone now in 2012. February 1989, The paddling pool in the front of the photograph was still in use. It has since been demolished, tarmaced and now used as a skateboarding area. Progress! More than 20 years have past since the southern end of the West Pier closed because of it's dangerous conditions. 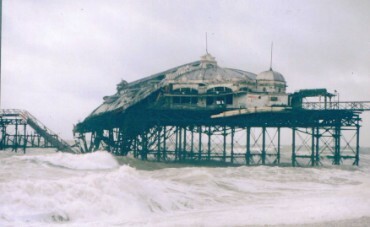 After failure of the £30 million rescue scheme by Merlin International, the future of the pier looks bleak. 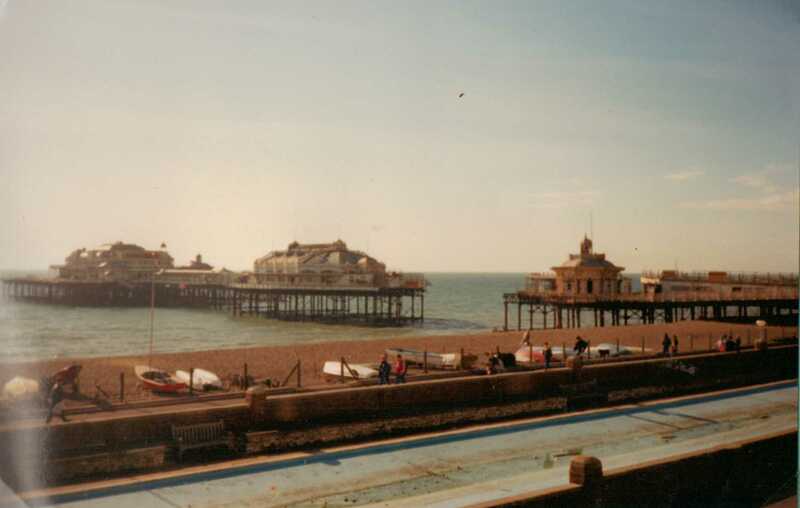 In May 1992 the Argus reports that the West Pier Trust plan to have the West Pier restored by 1997. 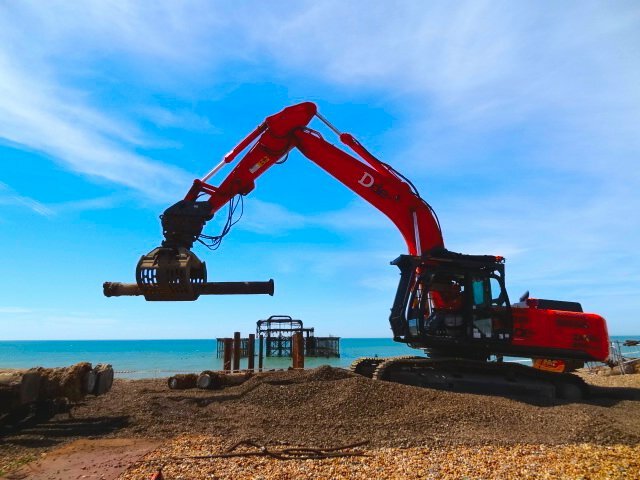 The West Pier Trust aimed to have the pier completely restored and open to the public by the end of the century at a cost of £15,000,000. By 1994 it aimed to restore the section over the beach, put back the entrance gates and start restoring the seaward end. 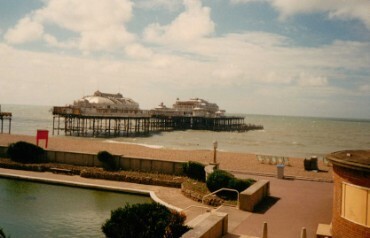 By 1995 the Trust planned to open the pier up as far as the concert hall with most of the pier being restored by 1997. January 2003. Another section of the West Pier crashed into the sea. 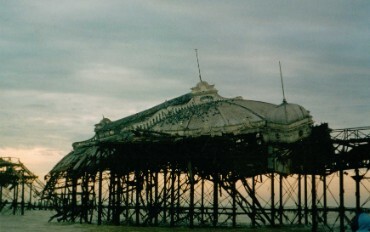 Gale force winds lashed the pier, collapsing parts of the concert hall. The collapse occured shortly after high tide with waves whipped up by a southern storm. February 2003. The collapsing concert hall at sunset. March 2003. Flames engulfed the West Pier after an arson attack. 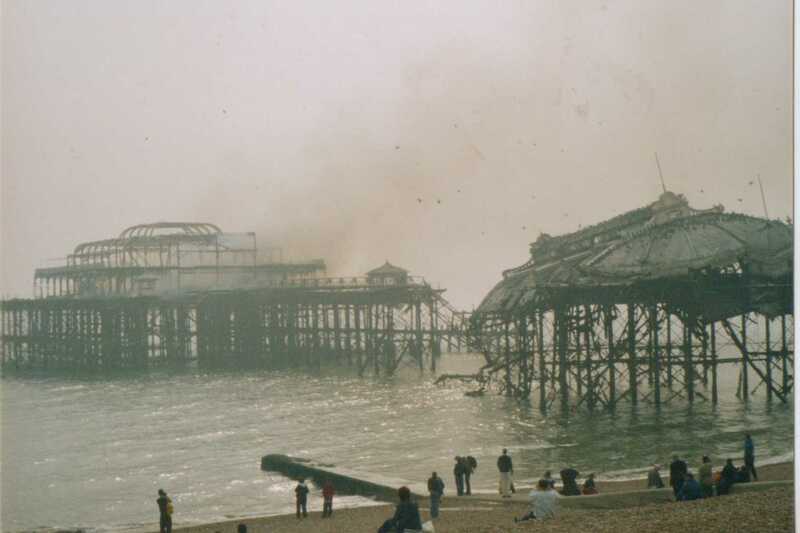 There were reports that shortly before the fire started , a speedboat was seen moving smartly away from the pier. This afternoon a smouldering steel skeleton is all that remains of the historic pier theatre. March 2003. The West Pier is set on fire by arsonists. Sadly I couldn't capture the fire itself as I was working but these two photos were taken the day after the fire. 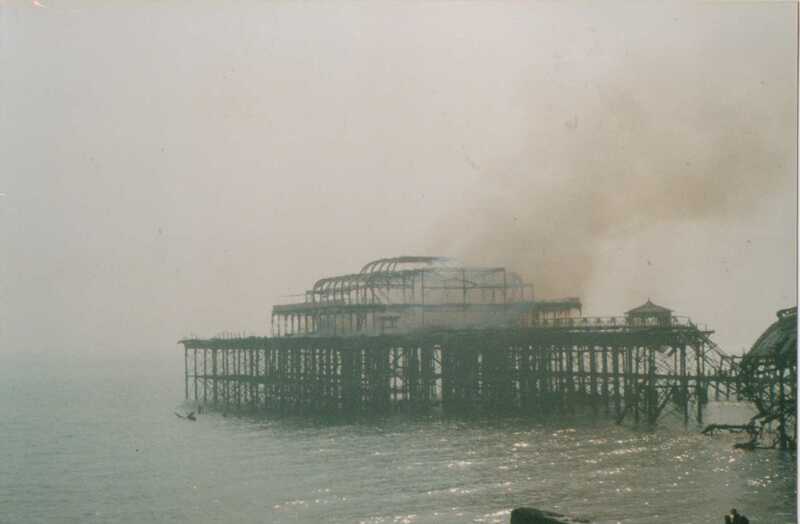 In May 2003 The concert hall was also set on fire destroying the last of the buildings on the pier. Just a shadow of its former self but somehow still managing to look majestic! February 2012. There is talk yet again of the West Pier being rebuilt. This time by property developer Mike Holland. February 2014. After a storm on the night of February 5th another part of the West Pier crumbled into the sea. The removal of the pillars on the beach. Demoliton of the remains of the entrance has also started in preparation for the building of the i360.